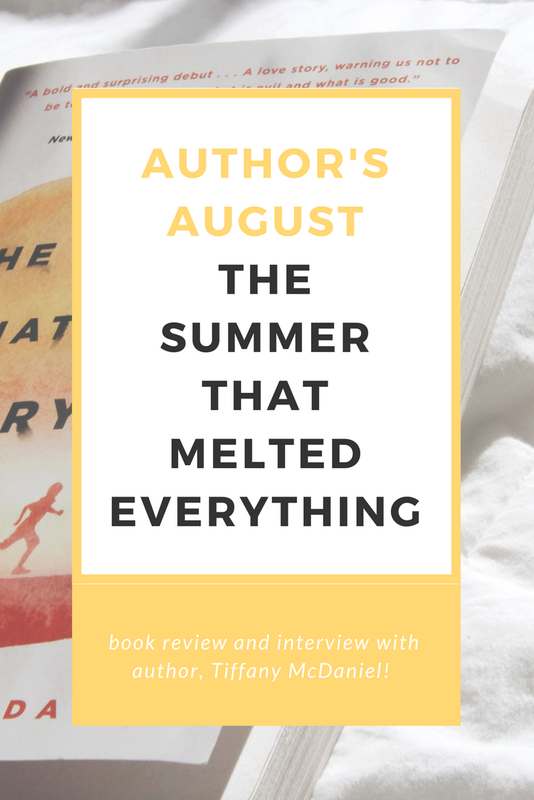 In July I entered a giveaway over at Annaish and I won a signed copy of The Summer That Melted Everything. Isn't the little note so cute?? When the author emailed me for my address, she asked if I had a book blog. Well, I talk about books and stuff so I guess you can say I have a book blog. Then offered to do an interview! So, of course, I was like "Heck yeah!" (not my words exactly but you know what I mean). I prefer to read the author's book before interviewing them because, yeah, I'm gonna want to talk about the book a bit. So, I started reading the book shortly after I received it and OH MY GOSH. I didn't really have a clue as to what the book was about when I started it but it blew me away. The Summer That Melted Everything is an adult contemporary with magical realism. I do recommend it to YA book lovers/readers because I, myself, am a lover of that genre and I enjoyed this book immensely. It does discuss heavy topics and is an overall deeper read. It honestly was one of the saddest books I have read AND I DID NOT EXPECT TO LOVE IT AS MUCH AS I DID. The setting of the book kind of reminded me of To Kill A Mockingbird for some reason. Even though I read that book a long time ago and I don't remember a thing (whoops). BUT IF YOU LIKED THAT BOOK MAYBE YOU WILL LIKE THIS? I just loved Tiffany McDaniel's writing style and all of her characters. I felt when they felt, I laughed when they laughed, and I cried. I didn't want to cry so towards the end of the book I had this lump in my throat because I was trying really hard to hold back my dying whale noises. Truth be told, I kind of just want someone to read this book so I can cry with them. o-o I know, I'm such an evil person BUT IT WILL BE SO WORTH IT. I promise. Tiffany is such a sweet person, you guys. She responded to all my emails right away. She also has incredible patience because she waited for me to finish the book before writing up my interview questions. But before I show you her fabulous answers, let's get to know a little bit about the author first. Tiffany McDaniel is an Ohio Native whose writing is inspired by the rolling hills and buckeye woods of the land she knows. Also a poet and artist, she is the winner of The Guardian's 2016 "Not-the-Booker Prize" and the winner of Ohioana Library Readers' Choice Award for her debut novel, The Summer That Melted Everything. The novel was also a Goodreads Choice Award double nominee in both fiction and debut categories, is a current nominee for the Lillian Smith Book Award, and finalist for the Woman's Fiction Writers Association Star Award for Outstanding Debut. You can find out more on her website. She also personally responds to emails if you ever want to send her one. ;) Now, let's get on with the interview, shall we?! Supercalifragilisticexpialidocious interview with author Tiffany McDaniel! What inspired you to write “The Summer That Melted Everything”? Are there any hidden messages within the story for the reader? The novel started first as a title. It was one of those really hot Ohio summers and I felt like I was melting. Out of true heat, the title was born. I always start writing a new novel with two things: the title and the first line. These two things lead the entire rest of the story for me. For me, inspiration comes less from an external force, and more from the internal creative wheel and the characters. The characters inspire me to write their truths to the best of my ability. As far as any hidden messages, I think with my writing there’ll always be layers and stacked messages within the story. As far as messages that mean something to me personally, I do tuck in names of family members and names of all the animals I’ve had in my life. Your writing is so deep and moving, it made me feel all the emotions. I applaud you for this. I’ve always wanted to write a book that makes the reader feel something. You know what I mean? With that said, did you initially want to write such a deep story because you wanted your readers to feel something or did the story just kind of fall into place? Does that make sense? Thank you for the kind compliments here. With my writing, I don’t outline or plan the story ahead. The story evolves with each new word and page that I write. Working this way, the story falls into place as the characters and the plot develops. I believe every author is born with a particular tool set. Some of us are born to write happy stories. Other authors are born to write more tragic tales. What this does is it gives the reader, and all of us, the gift of variety and the gift of balance. For me, these dark, deep stories have always been the way I write from the time I was little and was writing poetry and short stories. I’ve always been drawn to the crash, not the landing. I believe there is beauty there in broken things. Who is your favorite character in “The Summer That Melted Everything” and why? Spoiler: Mine is Grand because HOW COULD YOU NOT LOVE THAT PRECIOUS SOUL?! It is hard to say my favorite character, because I love them all. But Grand was one of my favorite characters to write. He’s grappling with that sense of self, and really trying to understand who he is. This makes him a character that I think most of us, if not all, can relate to. He’s also a character who is seen through the eyes of his younger brother, Fielding, who admires him. In that way, Grand represents that eternal big brother figure to us all. He’s someone that is hard not to fall in love with. Another character that was wonderful to write was Sal. He’s an old soul in a young body. He’s wise, creative, fiercely intelligent, and a mystery. These types of characters are always a joy to spend time writing. Can you tell us a little bit about your fondest summer memory? It’s hard to pick my fondest, but I think any of those summer days that were spent in the garden, fishing, running the hills, catching fireflies, and staring up at the night sky full of stars. All these memories are so special to me and I realize how fortunate I am to have them. How was the writing process for “The Summer That Melted Everything”? Were there any songs you had on repeat or snacks you kept beside you while your fingers typed away? I keep my writing process fairly simple. I don’t do character sketches or outline. The biggest key is to just be present in mind and body. Sometimes distractions get the best of us, so for me it’s important to limit distractions. My focus really needs to be on the page in front of me. Can you describe “The Summer That Melted Everything” in six words? “Who is the real devil?” Just shy of six words, but I think this question sums up what the novel sets out to answer. Word on the street is that you are also a poet and artist! Sometimes it is hard to get creative inspiration. So, what inspires you to stay creative even when the creativity seems to be slipping away? I like to keep the creative wheel turning, whether through writing, painting, or being in nature. I also keep creativity turning by learning more about the things that interest me in everything from archaeology to astronomy, biology to physics. I’m fortunate in that I never feel creativity waning or fading. It’s all about keeping that creative wheel turning and listening to what your imagination is telling you. The new paperback cover of “The Summer That Melted Everything” is so eye pleasing. Did you have any say on how it came to be? As a debut author, I don’t have any say on the book cover as per my contract. I thought the hardcover cover was a little too bright and young adult. But I think the paperback cover gives the story some fresh legs and hints a little more at what the story is about. Is “The Summer That Melted Everything” your first novel? Are you working on anything at the moment? If so, can you tell us what to expect? The Summer that Melted Everything is my first published novel, but my fifth or sixth novel written. I have eight completed novels. The novel I’m hoping to follow-up TSTME with is titled, The Chaos We’ve Come From. It’s the first novel I wrote when I was eighteen. It’s a story inspired by my mother’s coming-of-age from the 1950s to the death of her father in the early 1970s. It feels like a good time to return to this story, and to these characters. Do you have any tips for writers who want to be published someday? Never give up. 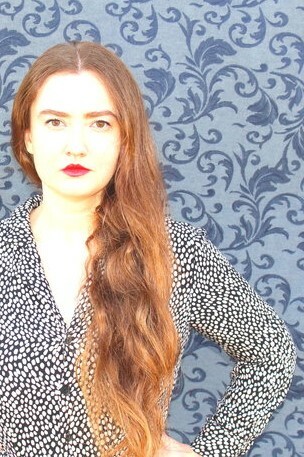 I wrote that first novel when I was eighteen, and wouldn’t get a publishing contract until I was twenty-nine for TSTME. It was an eleven year journey of rejection and perseverance. For the most part, publishing has been an uphill battle for me. I was told my writing was too dark and too risky, which I think is something female literary fiction authors hear more than their male counterparts. But the struggle to get published has made me the author I am today. An author who knows the value of hard work and the value of each and every reader. If I had given up during those years of working toward publication, I wouldn’t be where I am today, with a book on the shelf. So to all you writers out there hoping for publication, I say, don’t let rejection discourage you. Let rejection empower you. Believe that you, too, will one day be published. With that said, how does it feel to see your book out in the public? It’s a feeling that is hard to explain. After so long working toward publication, it’s a relief to see a book of mine on the shelf. But I know the hard work isn’t over. So far, writing has been the easiest part. It’s getting published, and then the marketing and publicity that is far harder. So it’s wonderful to see a book out in the world, but there’s little time at the moment to really sit back and enjoy that achievement. As a debut author, you’re constantly trying to reach more and more readers, so that publishers will deem you an author worth publishing again. It’s about making sure the book does good enough to make a career out of it, and there’s still lots more work to do and lots more readers to reach. Overall, I am so so glad I won this book and had the opportunity to read it. 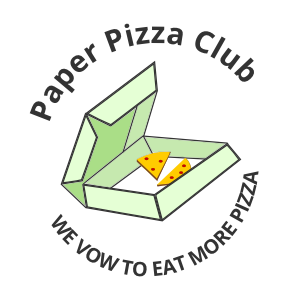 :) Thank you so much, Tiffany, for joining us on Paper Pizza! I hope your stay wasn't too cheesy (hehe, I love puns). Just a quick heads up: this book did include some swearing and a couple scenes that may be a kind of intense for some readers. If you want to know more, feel free to shoot me an email or DM. But I do hope you enjoy this book as much as I did. Have a lovely weekend, my friends. Has anyone read The Summer That Melted Everything? PLEASE LET ME KNOW IF YOU HAVE. 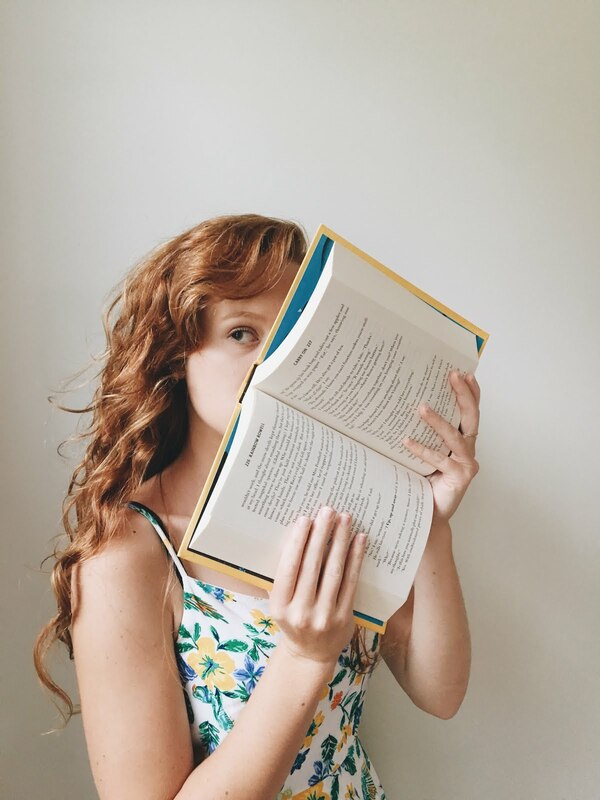 Also- What are some of your favorite summer reads? Do you have any recommendations for me? HAVE YOU EVER READ A BOOK AND THEN THREW IT ON THE GROUND DUE TO AN OVERHWMELIMING AMOUNT OF FEELS? Because same. pea ees: this is 100% not a sponsored post. Every word I typed was the truth and not exaggerated whatsoever. I really loved this book - I just felt like you should know. "I’ve always been drawn to the crash, not the landing." Isn't Tiffany so sweet?! I loved working with her; and I'm so glad you enjoyed her book! It's on my tbr. <3 Great interview, Kenzie.